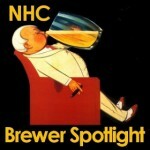 This month in the Brewer Spolight, we’re chatting to NHC Best Brewer, BrenMurph. He’s a long-time brewer and hosts the now famous, South Kildare brew days. In our interview, Bren kindly shares some of his secrets for brewing and competition success and tells us all about his homebrewing history. Hi Bren, can you start by telling us, how did you start home brewing? First, I have to acknowledge Kellie (Co brewer and brew day cook), our supportive brewing friends, and our brew day guests from whom we learn so much. Back in 1978, I think. I got my first job in Tesco in their Tallaght warehouse and a couple of lads there were brewing from kits so we had the odd (every Friday) meetup to drink the brews. The quality was very good generally and as I still say today, if you watch the basics, namely temp control and hygiene, the beer is usually grand to drink. We had regular Friday night brew/drinking sessions and we chipped in a tenner each and we played darts and cards. After the beer kits were paid for there was a tenner or so left to pay the winner of the darts and cards so someone went home with a free nights drinking. This went on for years. Over the next few decades I dipped into and out of brewing at one stage brewing wine quite a lot. To answer your question it was part social and part cost saving in addition to being a great hobby. I still have some of my original homebrew gear including a capper that leaves a lovely dimple in the cap. What are your favourite commercial beers? We love the Germans, nothing like a good Altbier or north German pilsner, however after being in Munich recently we were blown away by the incredible quality of their offerings not limited to Andechs Bock, Wehenstephaner Dunkel and Ayinger old beers including their outstanding old cloudy lager. Gong back a few decades it was Macardles when it was a special ale and Phoenix ale in bottle which is imprinted in my mind forever as very special ale creamy and flavourful. Describe your typical brew day for us. How long have we got??? I often brew two or three all-grains in a day, however to stick to a single brew day we would start with a recipe design on Beersmith followed to getting the ingredients out of the store and ground up in the mill. We never use crushed grain, always whole grains. Just like coffee is best fresh ground and brewed I believe whole grains are superior. Our system is a simple four vessel setup. A modified 7 litre boiler from Aldi for decoction. This is incredibly reliable due to a few electrical tweaks we made and gets us through a full all-grain brew and clean up in sub 4 hours without rushing. During brew day, which can be 10am or 4pm depending on work commitments, we generally check up and taste previous and current brews for progress. On official brew days (rather than my regular solo ones), Kellie always has great food, neighbours drop in, friends call by, some stay and some don’t. The days always end up late and many enjoy staying in our wonderful setting with great facilities. Do you tend to brew tried and tested recipes or do you prefer to experiment with new ones? I think the dozens of people who know us appreciate we are experimenters. We always sit down and discuss recipes and while tasting our numerous beers we critique them to find out how to improve flavour, balance and so on. We also continuously test commercial beers and beers left in by friends, guests and offer feedback to them. We seek out new ingredients and new flavours especially willing to try new hops. Recently we are working with minty and fruity hops. We don’t have a favourite. Lagers are great but u need patience, 4 months patience which most brewers don’t have. We brew several times per week and always trying something different. For session beers we edge towards a session bitter or Scottish shilling, other than that we have numerous unusual beers on our books. Kellie particularly likes the shillings and English browns. Click here for Bren’s award winning Scottish Shilling recipe. You picked up Best Brewer at the NHC National Brewing Championships. Were you surprised to do so well? Yes and No. In the previous 12 months we completed the BJCP course which helped a lot. My disappointment not to medal in 2013 only made me more determined to do better next time. We also built our dedicated self contained brewery and brewed every week, we also had in excess of 14 public brew days and attended nearly as many. We also attended Altech, RDS, and numerous research trips to UK and not least a week in Dusseldorf exploring their brewing traditions, Scotland and Munich. I also invested in a 1000 page Brewing Science journal collection, which has massively improved my understanding of all things brewing. We worked really hard to plan our assault on the nationals, it’s no fluke we done so well as anyone who attended our brew days know, we have an incredible passion for brewing and we entered our passion in the nationals as well as our bottles. One strategy we used in the previous year was we used only 2 yeasts, notty ale yeast and Mauribrew lager yeast. This allowed us time to understand the yeast and concentrate on other variables like malt and hops, decoction and no-sparge mashes. Every one of our medal beers was brewed on the same Mauribrew lager yeast and that includes our Scottish Shilling and our Altbier, both ales! We did have numerous comments after the show about targeting the ‘easy’ categories, well let me re-cap what we actually did, we planned 6-months in advance. 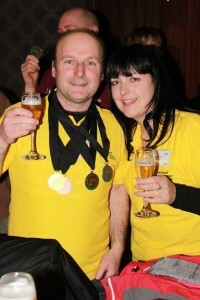 Our motivation for lager came from our friend Dodge who took Master Brewer for the best overall beer, we picked up 7 medals including 3 gold out of only 10 entries. Our lagers were all superb following 4-6 months work on them and deserved their rewards. What a lot of people don’t realise is that we also won the Scottish and Irish ales section, which I believe was the most competitive category with the highest overall average scoring, we done this with a Scottish 80 shilling that was lagered for 3 months and this also made the final 6 out of 400 beers in the competition. This beer was inspired by the Dublin Craft beer Ladies society who came to a brew day and helped brew it, as you can imagine, they were delighted. This beer was reviewed by Gordon Strong at Altech who described it as having “everything a Scottish Shilling should have in it”, it got its deserved rewards, a very difficult beer to brew as it has hardly any hops, the bitter balance comes from subtle dark roasts, the maltiness from no sparge & long boil and its cleanness from lager yeast and long cold conditioning. So I didn’t even know there was a Best Brewer prize till I got it and we believe we thoroughly deserved it. We knew that this year we had some outstanding beers and expected a medal or two but were delighted and excited to earn the title of best brewer 2014, we are of course on the 2015 case as we speak. Our brewing this year has gone from strength to strength, we have new methods and are working with new ingredients and using new water profiles, we also have some secrets weapons which we are not sharing at this stage as there is a considerable amount of prizes at stake that we are aiming to have a go at. Which beers do you find most challenging to brew and get right? None, we have made about every style of beer except Belgians at this stage and enjoy the challenge of making any of them. If I was to name the style I believe I am worst at, it’s the stouts. We make nice stouts but not outstanding stouts. However the most technically challenging beer to date was the California common that came so close to being a winner after 6 months attention to detail. Do you have any favourite malt or hop varieties? Yes, Dana, Saaz and Marynka. We took Gold in the nationals with a single malt and single hop lager made with Weyermanns pilsner and Marynka hop with just a touch of roast for colour in our Scwartzbier. I like a hint of Amarillo in an English ale. Without a doubt, beer and cream crackers…try it. Abstract question here, if you were a beer, what would you be? Tough question……but here’s an abstract answer from the top of my head…..
A bottle of Phoenix ale (anyone got a recipe?) as it reminds me of the good ol’ days when things were simple, no mobiles or computers, no Facebook or twitter and we enjoyed the simple things. When we went on holidays, we went on holidays, and escaped our normal life completely, this is something that today’s generations don’t understand. That’s what I feel a holiday should be. You regularly host brew days and tasting events at your house. In a few words, why should people come along? That’s best asked of someone who has been here. A guest’s view is better than mine. We offer a great social outing and we believe this is very important. We are really trying to get more wives onboard and we have significant success. We feel it’s a great social hobby and one the women can thoroughly enjoy. Our brew days are social, fun and entertaining. Kids are welcome and they have a great time too. We have gardens, vegetable crops, hop vines and even grapes in the polytunnel. We have BBQ and campfires where we really chill out later. We brew and serve great beer on simple no-nonsense equipment and banter bout whatever. We promote healthy food and healthy attitude to beer, keeping all our beers fresh, local and natural as possible using some unusual ingredients. Kellie serves incredible food and everyone goes home happy (some go home nearly crying coz they’d rather stay). For those who don’t go home we have the best overnight stay with camping, caravanning or camper-vanning or floor space or a bed for our guests. We grow our own hops and use fresh ingredients as possible for our dining and our beer. We get a lot of very positive feedback and people get a positive learning outcome and never shut up about their experiences. Our dedicated brewery and brew house is fantastic and does what it says on the can. We are the busiest and most successful competition brewery in the country and our guests are well looked after with food drink and knowledge so ye know where we are if you to absorb some of that. Last month was a beetroot lager brew day. Where did the inspiration for that recipe come from? Have you done many other “crazy” brews? We have done beetroot several times and love it as a food and a drink; I’ll say no more only try it. Don’t put it in the mash coz it turns orange; just stick in the boil or fermenter. We often caramelise it on a pan to enhance the caramelly sweetness you get from root vegetables. Other crazy brews include liquorice, Spruce, and a couple of other trials. We like chocolate and honey as adjuncts. We finished second highest score in the summer sessions with our lager made with corn from our own garden. I can’t say more about our current crazy brews coz they may appear in upcoming comps. Kellie has warned me that I’m in the doghouse for at least a month if I don’t win the “Red ale” competition…she wants that dirty weekend away in a fancy hotel! So I’m brewing and have been brewing a series of reds with a difference, we will have to wait and see in August if the dozens of hours experimenting pays off, I’m sure competition will be tough, keeping in mind it was the highest scoring category in the 2014 nationals!! However, we won that one! If you won the lottery tomorrow what would be the first bit of home brewing equipment you would splash out on? I would go to Weihenstephen and use their equipment when I enrol on one of their Master Brewer degrees! I already have a Master of Science degree in nutrition and would love to take up brewing science academically. If I won the lotto that would be my road, and no doubt I would be buying an apartment along the winding, steep, hop cropped hill up to Weihenstephener brewery and Studying just down the hill in the massive Weihenstephen brewing science campus. 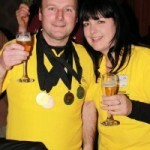 Finally, any tips for home brewers looking to pick up medals in next year’s competition? Yes, try ‘less talk and more action’….we brewed 200 all grain beers in the past 2 years and went on numerous brew holidays, events, seminars and thousands of brewing and drinking hours. Really though just try get a passion to learn and practise as much as possible and the results will come. I’d also say please remember that brewing is as much an art as a science so experiment and don’t read too much into any one person’s opinion, get the general feel for a topic and play around with ideas. Get to brew days, that’s where it all happens, we learned a lot from going to others and from people attending ours. Alex Lawes put me on to decoction, Dodge put me into lager mode and Rossa got me interested in old recipes, while BB got me focused on water treatments and Dodge showed me last year that keeping it simple and relaxed is a big plus. There are numerous other influences but it only happens by getting out there at meet ups, brew days and events. Gordon strong taught me to break the rules like starting a mash at 70 and let it automatically cool down through the range as well as never putting black malts in a mash. Specifically for the comps, plan what you want to do and stick with it and become master of that style and seek out someone good at those styles and go get some tips. E.g. Kildare, the lager champs! Rossa, for Saison advice. Dodge to learn how to brew a great Flanders, lager and many others and Partridge9 for help with weiss bier. And I’m sure there’s more that’s just a few off the top of my head! Those dozens of brewers who have not yet visited us please don’t procrastinate any longer, come along to a brew day or just arrange to call in to us for a few beers. We have a very comfortable and private luxury caravan waiting to accommodate you if ye fancy trying our beers and going home the next morning (or evening in many cases). There is lots to do in the area and Kildare Village is around the corner!